New vocabulary appears constantly: we invent words, or more usually modify existing ones, to meet the needs of expression – or just for fun. Sometimes, too, existing words get repurposed, switching grammatical classes or incorporating new ones: verbs and adjectives are converted into nouns, and vice versa. This attracts predictable criticism, but it’s a thoroughly ordinary process; nounings and verbings are a large part of the everyday formation of new usages. Other switches are more unusual. Anne Curzan at Lingua Franca recently reported that her students are using the word slash in innovative ways. In lines such as “I need to go home and write my essay slash take a nap”, what began as a punctuation mark (“/”) has become, of all things, a coordinating conjunction. These constitute a very narrow class, and the arrival of a new one is rare indeed. What’s more, slash is showing up at the start of sentences to set off a new topic or angle, as in: “I really love that hot dog place on Liberty Street. Slash can we go there tomorrow?” (again from one of Curzan’s students). These migrations are significant and surprising. Curzan compares the emergence of slash as a new function word to “a rare-bird sighting in the world of linguistics”. Another recent grammatical change is the transformation of LOL. In a casual reply like “lol, i hear you”, actual laughter is probably not occurring. 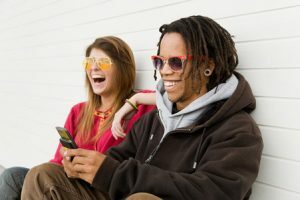 What began as an abbreviation meaning “laughing out loud” (or “lots of love”) is losing this explicit meaning and now frequently serves as a pragmatic particle marking empathy and a shared frame of reference, according to linguist John McWhorter. Something similar, McWhorter says, has happened to the phrase (Do) you know what I’m sayin’? – it isn’t really the question that it superficially appears to be, but rather is “a piece of grammar, soliciting the same sense of empathy and group membership that LOL does”. Given its frequent informal use, the phrase is often compressed into a syllable or two for efficiency. If you search Twitter for nomsayin or knowmsayin, you’ll see how common this is. Grammatical innovations can be subtle, but they play a long game. Compared to new vocabulary, they represent deeper modifications to the structure of a language. Whatever their particular source, and whether or not they spread to standard use, they signify a language in good health. And the more useful they are – the more functionally they slot into niches in our daily lives – the more likely they are to catch on. Knowmsayin? Brilliant. Btw, what do you use when you DO mean “laugh out loud”, now that ‘lol’ is just some kind of pragmatic marker? I like ‘slash’, though it’s new to me. As you say, conjunctions “constitute a very narrow class, and the arrival of a new one is rare indeed”. Another coordinating conjunction that hasn’t yet hit the grammar books (although Charles Owen, Uni of Birmingham does include it in his grammar courses). is the word ‘PLUS’ as in “We tend to eat more fruit and vegetables in summer, plus we are likely to take more exercise…”. Like ‘slash’, ‘plus’ is often sentence-initial, e.g “Plus I am going to buy some padded shorts to ease the process”. Of course, ‘plus’ is far more established than ‘slash’, but ‘slash’ may well make the jump into the ranks – time will tell. Other newcomers are prepositions – I’ve talked on this blog about new meanings of ‘across’, ‘ahead of’, ‘around’ etc. But these were just prepositions finding new uses, while ‘slash’ is a true outsider.. Thanks, Gill. People have various strategies for indicating actual laughter, such as typing out the laugh (ha ha ha, etc. ), or using actual lol (= alol), genuine(ly) lol (= glol), lol for real, and so on. Some reserve uppercase LOL for laughter and use lowercase lol less literally. I tend to type out a laugh; Heh would be a short chuckle, for example. I like these new usages of slash too, and you see the similar things happening with the equivalent term stroke in some populations. Plus is a handy addition to the set. And then there’s also OMG which has taken on a life of its own in a similar way. What I find fascinating there is the ping pong back into written form as “oh em gee” – suggesting the actual enunciation of those three initial letters conveys a meaning which is somehow distinct from the abbreviated form that kicked things off in the first place. Kerry: That’s another interesting example. Oh em gee seems a more knowing form, and almost certainly light-hearted, whereas OMG – for all its memetic frivolity – sometimes carries the weight of the full, original phrase. Oh em gee is also much more restricted to type, I think, being used almost exclusively by young people, usually girls (or occasionally older people aping them). I’ve definitely noticed “slash” being used as you describe. Another instance of punctuation being verbalised is “dot dot dot”. I can’t give you any specific examples, but I’m sure I’ve heard people saying things like “Watch this space dot dot dot”. It implies that something interesting is likely to happen. Elizabeth: “Dot dot dot” is a great example of verbalised punctuation. I come across it now and then, usually in informal contexts. A search on Google Books returns this example, from Boys’ Life magazine in September 1965 (in the caption under the left-hand photo): “Then dot-dot-dot-dot . . . a football game begins to emerge under the artist’s skillful hand”. A related usage is “period”, serving to indicate the finality or indisputability of what someone has just said. Stan, Eliz – I’ll look out for ‘dot dot dot’. And apart from ‘period’, in BrE we also say ‘full-stop’ – which is an example of those very basic AmE/BrE differences. I was thinking also that the way we use ‘End of.’ is almost like ‘period’ in its brevity and the fact that it always has a full-stop – and it marks discourse boundaries in the same way. @Stan – the “dot-dot-dot …” in that caption is also a play on words, as the article refers to how Dali uses a pointillist technique to do that particular drawing. Gill: Oh yes, of course: “full stop” is used pretty much identically. I wonder if “End of” began as a longer phrase (e.g. “End of discussion”) before being abbreviated, or was it independent and elliptical from the word go. Stephen: Yes, at first I wasn’t sure if it intended the “dot dot dot” = “…” inference at all. I think it does both, as you say. I think we should be very careful about these new meanings of words, let alone trying to teach them. We should correct the students if they use these “new hypermodern words” because they come and go. Even though our students will claim that we know nothing and do not follow the modern trends we should teach the “normal” because they will stay and be used. There is nothing more embarrassing than when you use a cool word and all the native speakers start to laugh because no one uses the word any more. Zdenek: Of course, what we teach is often different to what we use. The former places more emphasis on Standard English, while the innovations I describe in this post are more appropriate to other varieties of English, generally informal and chatty (and some people will never adopt them). But over time all words are susceptible to change.